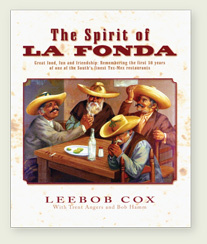 La Fonda merchandise can be purchased by calling (337) 984-5630 or visiting us at 3809 Johnston Street. Gift cards are available in amounts starting at $25.00. This gift card is redeemable for food and beverages at La Fonda. It is not redeemable or refundable for cash. A book describing the 50-year history and culture of the venerable La Fonda Restaurant in Lafayette, La., one of the state s most popular eating establishments. The book is also an autobiography of the restaurant s founder and owner, Leebob Cox, and a showplace for the art of Luis Amendolla and Phyllis Malzyk Giardano. It carries numerous stories about La Fonda s longtime employees and customers, as well as anecdotes of the variously zany and heartwarming goings-on in this fine Tex-Mex eatery. 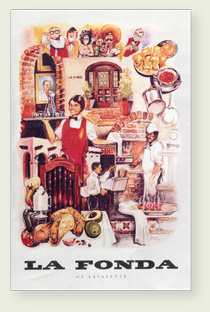 The La Fonda of Lafayette poster celebrates 20-year history and culture of the venerable La Fonda Restaurant in Lafayette, La., one of the states most popular eating establishments.